Here is a Diwali Gift that will help your elderly (grand)parents move around with ease. Do you or your elderly relatives find it difficult to get off the car seat? This unique cushion swivels 360 degrees to make it easy to get in and out of any car. The foam cushion sits on a turntable base so you can swivel sideways to get in or out of the seat without straining your back or hips. Lightweight and portable. Height adjustable, high-grade aluminium walking stick with quadripod base and L-shaped handle. The base swivels ensuring that the base is firmly placed on the ground irrespective of the angle of pressure or angle of the surface. Provides superior grip and comfort. For regular use, for people with minor balance issues and weak legs. Here is a Diwali Gift that will help your elderly (grand)parents move around with ease.1. Swivel SeatDo you or your elderly relatives find it difficult to get off the car seat? This unique cushion swivels 360 degrees to make it easy to get in and out of any car. The foam cushion sits on a turntable base so you can swivel sideways to get in or out of the seat without straining your back or hips. Lightweight and portable.2. 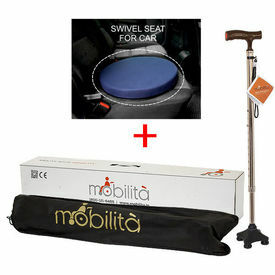 Mobilita walking caneHeight adjustable, high-grade aluminium walking stick with quadripod base and L-shaped handle. The base swivels ensuring that the base is firmly placed on the ground irrespective of the angle of pressure or angle of the surface. Provides superior grip and comfort. For regular use, for people with minor balance issues and weak legs.